To replay background music or sound tracks from your favorite Dailymotion videos on MP3 player, you can extract the audio first. Converting videos from Dailymotion to MP3 is easy if you conduct this conversion with Aimersoft YouTube Downloader for Mac. Well compatible with Mac OS (Mountain Lion), Aimersoft Video Downloader and Converter for Mac can give you a portable selection of audio for your MP3 player. With it, you can download any videos from various video-sharing sites like Dailymotion, YouTube, Vimeo, Metacafe, VEVO, BlipTV, Hulu and more. After successfully downloading the videos, you can convert the videos to many popular video formats and also extract audio and transform to MP3 or other audio formats like AAC, WMA, WAV, AIFF and more. This Dailymotion to MP3 converter also provides a plenty of optimized presets to fit your mobile devices like iPhone, iPod, iPad, PSP, Android mobile phones and more. To extract audio from Dailymotion videos in Windows-based computer, you can have a try on Aimersoft Video Downloader. It is a versatile program that integrates a video converter, a video downloader and a video editor, which can definitely fulfill your needs to touch up videos. Download Aimersoft YouTube Downloader for Mac and install it in your computer. Run this application. Launch your browser (Chrome, Firefox or Safari) and visit Dailymotion. Search for the videos you want. To download videos from Dailymotion, you can click the pop-up Download button near the video playing window. 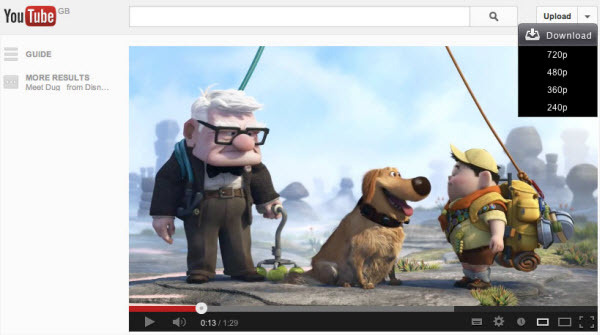 Or Copy the URL from the address bar and turn to the interface of YouTube Downloader for Mac and click "Paste URL". You can also drag directly the URL to the interface and the video you choose will be downloaded automatically. When the videos have been downloaded successfully, turn to the Downloaded tab and click the "Convert" button. In the "Output Format" option, choose MP3 from the audio category as the output format. Before starting the conversion, you can choose an output folder to save the converted files or just store them in the default one. When all settings are done, simply click "OK" to activate the conversion. Dailymotion is established in March 2005. The company was technically founded in the living room of one of its two owners, Olivier Poitrey. The other founder was Benjamin Bejbaum. The two were joined by four other people to amass the 6,000 euros needed to jumpstart the business. When the company started to rise, Partech International and Atlas Ventures became part of the company as well. Along with other new investors, 7 million euros were placed in the business. Even the French government took part in the dealings of Dailymotion, as well as big name business Orange Telecoms. Dailymotion is an well-known video-sharing website where people upload, share and embed the latest music videos, short movies, tv shows, funny and extreme videos. Thanks for the software. I like the converter and it is very useful to me.